As is customary on this site, on the first Friday of every month, I update the unemployment numbers so that I can compare the unemployment rate under President George W. Bush with the unemployment rate under President Obama at that time. The genesis of this ritual began when I felt compelled to respond to some left-leaning sites that were comparing Obama’s first two years and four months in office with Bush’s last and worst economic year (the above chart shows the most recent incarnation of this narrative). It is also important to note that I made a slight change in methodology for these charts. In the past, the president who was in office at the end of each month received credit for the jobs created or lost in that month. As such, President Bush received credit for jobs lost in January 2001, and President Obama received full credit for jobs lost in January 2009. Now, I am giving each president credit for the net jobs lost or gained for the fraction of the month he was in office. For instance, President Bush will now get credit for 61% of the jobs lost in January 2009 (i.e., 19 days divided by 31 days), and President Obama will get credit for the remaining 39%. 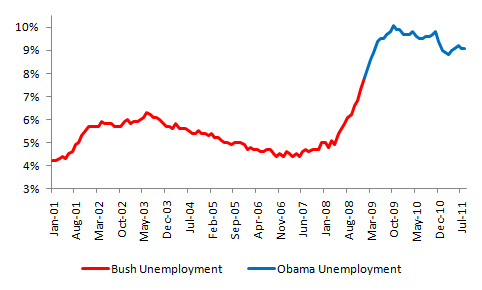 President Bush will also only get credit for 39% of the jobs lost in January 2001. In August, the private sector added 17,000 jobs in the eighteenth consecutive month of private sector job growth. This development is moderately positive news. 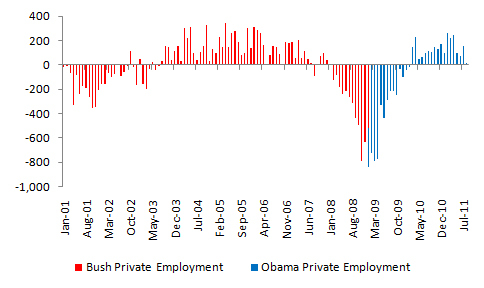 That said, the country had a net employment gain of zero total jobs (private and public). That’s right. Employers added zero net jobs in August. Furthermore, 0 falls well short of the 125,000 jobs needed every month just to keep pace with the growth of the working-age population. The seasonally adjusted unemployment rate remained unchanged at 9.1%. This number remains 1.8 percentage points worse than President Bush’s last full month in office in December 2008. It also marks 31 consecutive months in which the unemployment rate has been 8% or higher in the 32nd month of the Obama Presidency. Furthermore, the unemployment rate only accounts for the percentage of the unemployed who are actively seeking employment. It does not include people who have given up on finding employment. The good news is that the month ended with more people employed at the end of August than were employed at the end of July. The bad news is that the civilian labor force increased faster than the number of new net employees. The civilian labor force ended July at 153.2 million vs. August’s 153.6 million. In contrast, 139.3 million people had jobs in July. The number of people with jobs increased by about 331,000 people from July to August, whereas about 366,000 people entered the labor force. 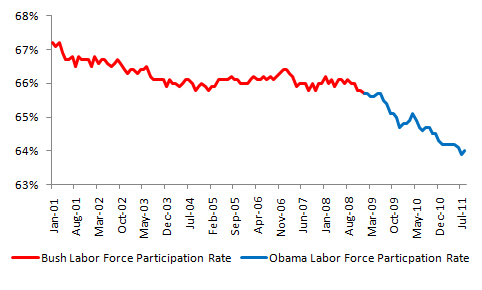 Both the Bush and Obama presidencies have been marked by a steady decline in the labor force participation rate. The labor force participation rate measures the number of people in the labor force as a percentage of the total working-age population. The labor force participation rate increased 0.1% in August from 63.9% in the previous month. Therefore, the unemployment situation is even worse than it appears, because it does not account for people who have been forced to exit the labor market, because they can not find jobs. President Bush’s overall record continues to look far better than President Obama’s to date. Over President Bush’s tenure, the private sector lost a net 346,000 jobs (the private sector gained a net 141,000 jobs under the old methodology). Surprisingly, this number includes the 3.78 million private sector jobs lost in 2008, and an additional 515,000 in 2009 under the new methodology. In contrast, under President Obama’s administration, the private sector has still lost a net 2.14 million private sector jobs (2.65 million under the old methodology). If I blame Bush and Clinton for the January 2009 and January 2001 numbers, respectively, the private sector would still have lost 1.81 million private sector jobs under the Obama administration. For every job that the private sector cut under George W. Bush, the private sector eliminated ~6 jobs under Barack Obama (under the old methodology, the private sector eliminated ~19 jobs for every job it created under Bush). While the private sector job outlook has improved recently, the economy still must create 2.14 million private sector jobs to break even. This entry was posted in Business, Finance and Economics, Media, Policy, Politics and tagged President Bush, President Obama, Unemployment. Bookmark the permalink. You need to look at fiscal years. It takes time to enact policies and those from previous administrations don’t end the day they leave office; they continue for quite a few months. I think this is the fairest way to do it. Every other way I can think of is too subjective. Even progressive sites count February 2009 against Obama (though they blame Bush for all of January 2009). Obama signed the stimulus in February 2009, and therefore had a significant impact on jobs early on in his presidency. People on the right could make the equally ridiculous argument that Obama should take credit for all the unemployment numbers since he was elected in November 2008, becausse the private sector reacted to news of his election by shedding jobs. Blaming Bush for all the numbers until October 2009 is a bit much to say the least. 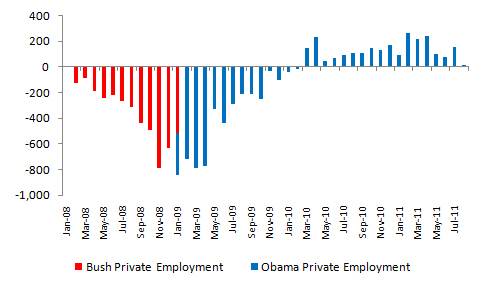 Obama signed the stimulus in February 2009, and therefore had a significant impact on jobs early on in his presidency. Most economists agree it had a positive affect on jobs and only contributed a small amount to the 2009 fiscal year deficit. The bulk of the Stimulus didn’t kick in until 2010. I think these statements are true. I would agree that the stimulus had a short-term positive impact on job growth and prevented the bottom from falling out of the economy in 2009. If you look at the first derivative of ob growth, it appears to be increasing until, of course, President Obama passed the PPACA in March 31, 2010 (the Healthcare Bill). After that, job growth sharply decelerated, as businessees reduced hiring, potentially as a result of the labor costs they saw associated with the PPACA. I’ve blogged extensively on this, but it is difficult for either side to prove definitively one way or the other. There’s no evidence to support that, but there is evidence to support the fact that small businesses were more able to hire, thanks to health insurance co-ops. There’s plenty of evidence to support that businesses reduced hiring. Business owners have testified before Congress to support this view. I’m curious, what evidence exists to support your “fact” that small businesses were more able to hire because of health insurance co-ops? I’m not suggesting the evidence does not exist, I just haven’t seen it. Can you provide a link to the source? Under the same logic, someone who lives in a house for years and then one day sets fire to it intentionally to collect the insurance money could argue that the fire department is to blame for the destruction because most of the damage occurred after they were alerted to the blaze. No matter that they hustled over in under 5 minutes and proceeded to put it out…look how bad the house looks now that they are here! First of all…my first comment here. I enjoy knowing that there might be other right-lean independents/moderate Republicans out there. I stop in at this site sometimes to enjoy this perspective. I apologize in advance for writing a small novel. I think it’s obviously unfair to pin 1/3 of the job gains/losses from January of an inauguration year to the newly inaugurated President. He’s still trying to find out which door leads to the oval office at that point. I tend to think March is a good month to begin to turn over credit to the new guy since although it’s still too soon to have done much, at least you’ll have had ~40 days in office and some chance to have actually done anything at all. It gives you one month for “orientation”, and doesn’t let the former President off the hook for what happens starting less than two weeks after his last day. The best example for why this should be the method of evaluating is the most recent one: Obama and the Stimulus. President Obama basically showed up on Day 1 with the bill and it didn’t get his signature until nearly a month later, on Feb 17th (I believe that was the day he signed it). It took one month to pass a bill of economic significance even with the most agreeable President and Congress in recent memory. That alone is evidence enough to me that March is the first month that a President can be having any real economic impact at all. Ultimately, the larger point is that things must be taken in context, and no single number tells the whole story. This sentence: “President Bush’s overall record continues to look far better than President Obama’s to date” is egregious in its abuse of statistics. Tracking the stats is important but only in context. Under the same logic, someone who lives in a house for years and then one day sets fire to it intentionally to collect the insurance money could argue that the fire department is to blame for the destruction because most of the damage occurred after they were alerted to the blaze. No matter that they hustled over in under 5 minutes and proceeded to put it out…look how bad the house looks now that they are here! No matter that they hustled over in under 5 minutes and proceeded to put it out…look how bad the house looks now that they are here! Stephen, thanks for stopping by and commenting. First, as I noted in the post, “the point of this argument is not to assess blame on either administrations’ policy. It simply puts the numbers into perspective.” I am not trying to “pin” the numbers on either President. I am just trying to establish a useful and objective basis for comparison. I have been very careful with my language in this regard (with the exception of the point you make later about Bush’s record looking better than Obama’s). For instance, I never say that Bush or Obama “created” these jobs, but rather that the private sector created them during the Bush or Obama administrations. As such, I think assigned ~1/3 of the month to Obama is objectively the most accurate way to describe what the private sector was doing — that is, it created or destroyed X jobs while Obama or Bush was sitting in the Whitehouse. It makes no assumptions about who or why the jobs were created or destroyed, But it does establish a basis for which President was sitting in the White House when they were created or destroyed. This is a fair point, because my statement implies that job creation and/or destruction under the President was a direct result of that President’s policies. Furthermore, as you point out, no single number tells the whole story. I obviously missed this nuance in several versions of this post (I release an updated version each month as soon as the jobs figures are released), and will correct it in the September release. That said, I think your analogy is a bit crude in the sense that I do not think anyone, Republicas or Democrats, deliberately sought to destroy the economy. Otherwise, I can see where you might be coming from. You should go back a like number of months for Bush. Here we are showing 2 years of Obama but only going back a year on Bush. This only captures the precipitous drop at the end. The third chart includes Bush’s entire presidency. If you just clip out his first six years, you can compare Bush’s last two years with Obama’s first two. So you’re a rational Republican ? If so, you are in the elite group of how many? Perhaps a hundred in the nation? I have seen figures, not provided Democrats, that state the Bush presidency “gets credit” for the creation of the smallest number of jobs, of any presidency with the president serving a whole term (4) years, since they began keeping records during the Truman administration. (Bureau of labor statistics) I put “gets credit” because president’s create very few jobs themselves. You keep comparing Bush to Obama, straining to make the figures work in your favor. Let me post a very, simple analogy, that Repubs, rational or otherwise, can’t seem to understand.. It goes along with the burning house situation. An analogy is something used to persuade those that cannot detect the flawed, or non-existant arguments. – Wikipedia. A bus, fully loaded with passengers leaves it’s terminal beginning on a trip. It lets passengers off, and picks up a few passengers along the way. It’s a school bus, or a city bus, departing uptown, to drop off students or an adult work force , near their homes. it makes the first few of these stops successfully.. It gets on a highway, and gets up to highway speed. Then it rounds a corner too fast , and goes over a 300 ft cliff. It travels in a horizontal trajectory momentarily, before heading toward the ground. Then it hits the earth, and crashes, killing many of those on board. Unfortunately, but nevertheless, Obama jumped aboard through the emergency door in the rear, just as Bush jumped out the front door, right as the front wheels left solid ground. Essentially, Obama had to ride it to the ground, just as any numbskull Republican president after Bush, would have had to do. A couple of interesting statements made by H.L. Mencken : “The formula of the argument is simple and familiar : to dispose of a problem, all that is necessary is to deny that it exists.” Here’s another: “The moment we want to believe something, we suddenly see all the arguments for it, and become blind to the arguments against it.” He was born an American, but was not a proponent of representative democracy. You should read more of his thoughts. It helps one become more rational, in a simple, non partisan way. * Consumer confidence index- 1/2001- 115.7;– 12/2008- 38.0, all time low,to that point in time. * Families living in poverty- Census 2000- 6.4 million;— 2007-7.6 million. * Americans without health insurance–Census 2000- 38.9 million; census 2007- 45.7 million. * Iraq war started 5/1/2003– “It’ll be a cakewalk” ; “be over in 2-3 weeks at most”– GWBush; “They will greet us in the streets with flowers”- Cheney,I think. * For you Obama” too much golf, and vacation whiners”— Bush went to Crawford, to his pig farm:(look it up; previous owner used land as pig farm), 77 times during his presidency. The US govenment spent $17,407,544.00 total, taking him roundtrip to Crawford , so he could cut brush, and ride his bicycle. This dollar figure omits the C-17 cargo plane that goes along too, each time, at an hourly cost of $6900.00 /hr. Figures arrived at by using Washington -Crawford -1295 miles, and Air Force One, flying 630 miles/hour, which is a stretch,but keeps costs lower than they actually are, attempting to help you out a bit. * During his presidency, Bush spent 490 days at the ranch, and 487 days at Camp David. Part of this vacation was going on as the worst hurricane in U.S.,History was taking place. Rather than going back to Washington and taking charge, he went out west, and gave some speeches about WWII. He was so pathetic during one of these live speeches, that Fox News,Yes-Fox News, cut away from the speech, and switched to New Orleans to cover the hurricane. Based on the above, why do I need get worked up, about Obama playing golf ? Because of the unemployment? Why weren’t you excited when Bush Lost a net of 1.1 million jobs? Bureau Labor statistics. * Republicans are tough on terriorists? After 9/11, Obama was the one that got rid of bin Laden, located in the same dwelling as he had been, for at least 3 years of the Bush presidency. Iran has been developing nuclear weapons during Bushs’ presidency. North Korea’s nuclear stash of weapons quadrupled by mid 2006. Sure Obama’s presidency has lost jobs– He took over when the Bus went on over the cliff. Is the idea that everyone that died in the crash , Obama’s fault ? You know better. You also have never said anything about what a Republican President with a golden wand would have done, had he been elected. As history is made, you will learn, that simply putting America’s tax revenue into pet projects,or the military, or keeping it in the bank, as your party keeps suggesting, won’t get the country out of this recession. Oh the horror ! Obama has a trillion dollar budget ! So did George W. Bush, the out of touch guy, that conducted himself, for eight years as a boy king, with Alfred E. Newman’s philosophy: What; Me worry ? Feel free to attack me—- You are after all , the war party ( doesn’t matter if you invade the wrong country. I know how to spell, but there may be mistakes- I never took typing. If my facts are off enough to skew the data, shoot at me. I can provide further sources. Why do I go back to Bush , since he’s gone ? His are the last Republican figures that I can compare anything to. Are both parties numbers pretty bad ? Sure, but stop telling me how bad Obama is , unless we compare his numbers accurately, to someone elses. You’re telling half the story. Last week, we discovered a new planet in an area of the galaxy, that it is possible to have water on it. It’s compared to earth. When you present me these facts, please also let me know that it is so far away, that our current technology (space shuttle) would take about 22 million years to get there. Then I get the real picture. This is way too long, but I keep seeing too many extremely biased “facts” from “rational people” basically a large number are from folks that can’t stand a black guy being president. Or as The brilliant Sen Jim Dement,Repub., stated soon after Obama took office: “My main job is to bring Obama down”. Heck of a guy, full of that partiotism republicans are known for. Think about that. An elected senator wanting a U.S. President to be a failure, before being in office a month. Not enough brains to see that any U.S. President being a failure, will never make the country any better. You and I are that country………. I’m not sure this comment is very effective at establishing non-partisan credentials, but I’ll give you the benefit of the doubt and read on. I’m not straining at all. I’m using official government statistics and presenting them the way they are reported. The metholodology I use is clearly explained and accessible to everyone. If you don’t agree with the methodology, by all means, recommend an alternative. I understand the bus analogy and agree that Obama inherited a mess. Yet during said economic emergency he added a $938 billion entitlement program (over 10 years — I’ve been chastised by liberals in the past for not explicitly mentioning that, so I will here), rather than using every ounce of political capital to get the economy moving again. He had a Democratically-controlled Congress for his first two years of office. Yet, here we are three years into his presidency with an unemployment rate that is higher than it was at any point during the Bush Presidency. The problem with your bus analogy is that it takes far less than three years to stop a bus. You should probably read his thoughts as well. Under Obama, this figure has risen to ~15 million, roughly double the 2007 Bush “occurence”. This is partly true. The convential phase of the operation was over in ~3 weeks and was the fastest land invasion in history. GW Bush failed in three aspects: 1) he did not invade with enough US forces to secure Iraqi cities, 2) he disbanded the Iraqi Army and 3) he disbanded the Baath Party. Had he not made these three strategic errors, the history may have been completely different. Now I obviously cannot prove it would have been different, but you cannot prove it wouldn’t have been either. I challenge you to find one instance on my blog in which I compare Obama’s vacations to Bush’s vacations. Just one. I guarantee you won’t find it. Why? Because I looked at the data and concluded Bush took more vacation time than Obama. The bottom line is that Presidents take way too much vacation. But before you accuse me of something, please do your homework. Well, because I started this blog in 2011, I guess. Well, there wasn’t a single terror attack in the United States since 9/11, because American armed forces killed them overseas. I believe one of the classified rationales for going into Iraq was as part of a “honeypot strategy.” Create a tantalizing opportunity for terrorists in Iraq, so they are drawn to Iraq and not the United States. It is far easier to kill an enemy with a tank than with a lawyer fighting against the ACLU. I will give Obama full credit for risking a potential nuclear war between India and Pakistan by going in. That said, the capacity he had to execute the operation was developed during the Bush Administration. I’ll give you Iran. We should have executed a precision strike on that country’s nuclear program in 2006. I wrote my masters thesis on it. Actually, we no longer have any space shuttles. President Obama cancelled that program. Oh and there it is! The not-so-thinly veiled racism charge. Lovely. Both parties are exhibiting ridiculous partisanship. If you don’t see that, and can only attribute it to one side, you might want to reread that quote you sent me. Your comment: “Actually, we no longer have any space shuttles. President Obama cancelled that program” is but one more example of either ignorance, stupidity, or wanton negligence of facts. President Obama did NOT cancel the Space Shuttle; that program was scheduled to end before he took office for a variety of reasons, including concerns about the reliability of the space shuttle fleet as well as the Bush administration’s reluctance to support the cost of continuing operations. Your insistence on essentially using Obama’s inauguration date as the beginning of his administration’s responsibility for the economy is another example of willful ignorance or wanton negligence – take your pick. A better gauge of economic policy is to look at trend lines, and it is apparent that the policies of the Obama administration (in spite of obstructionist policies by obstinate Republicans) are having a positive effect on the workforce. If you know anything about economics, and it appears that you do, then you should also know that merely authorizing money to be injected into the economy is not the same as actually getting that money THROUGH the economy and into the hands of employers, who can use it to hire, and consumers, who can use it to spend. So even though Obama was able to get a (scaled-down verson of) his stimulus bill through Congress, the fact that the money was authorized doesn’t meant that it was either immediately available, or even immediately helpful, in stemming the trend that had begun under the second four-year term of the Bush administration – which was a freefall into virtually uncharted territory. But for TARP and the economic stimulus, it’s hard to know how far our economy would have tumbled although most economists agree that it would have been much more severe than it was and is, and likely at least as bad as the Great Depression of the ’30s. Not surprisingly, as a self-identified Republican, you feel compelled to defend the reckless and irresponsible notions of your party in spite of all evidence and facts that show those policies – trickle down economics; tax cuts for the wealthy; etc. – as causative elements of our current economic dilemma. And, as a staunch Republican, you also cannot find it in you to give credit where credit is due, in spite (again) of many studies and qualified expert opinions that indicate that the policies of the Obama administration have been largely responsible for stemming the tide of economic disaster begun under the Bush administration. Are you making an argument that it takes government over THREE YEARS to spend money. Wow. That’s rich. I also think government is inefficient, but not that inefficient. Apparently, you do. I actually agree with your point here, though I think arguing that the Great Recession could have been “likely at least as bad as the Great Depression of the ’30s” is a bit hyperbolic. Very true. It’s all how one interprets the data. Well, it seems that you have some very level headed comments. It’s nice to see after watching the republican party continue to slide to the right so far that they’ll probably be meeting up the left on the other side soon. I agree that there are many things that have lead to the economic problems we face today and not all are due to one party. One thing I can say is the cost of having GW in the office, with the prescription drug bill he passed and two wars he started has been expensive. It will cost much more through the years with the benefits due to the veterans coming home and he had none of it paid for/budgeted. That is a truly unforgiveable sin for a Republican. I prefer my president to be someone I appreciate for being “real” (a human being). Barack Obama can relate to others and has a human quality. I don’t know what the heck Mitt Romney is but he certainly has no ability to relate to a normal human being or how to care for a dog. That really frightens me. I like the “go borrow money from your parents to start a business” line as though right now it’s that easy for kids to do. They both seem alien to me. Mitt Romney lacks charisma, but has the same belief system I do. Barack Obama has charisma, but supports a belief system that is alien to everything I believe. He also eats dogs, which is stranger than putting one on the top of his car. Sean, your level headed calmness in replying to the remarks from SA amazes me. Well presented. Thanks, Larry. I enjoyed doing it.